The Chesapeake Bayhawks and Denver Outlaws made a minor trade on Thursday, swapping away rookies. 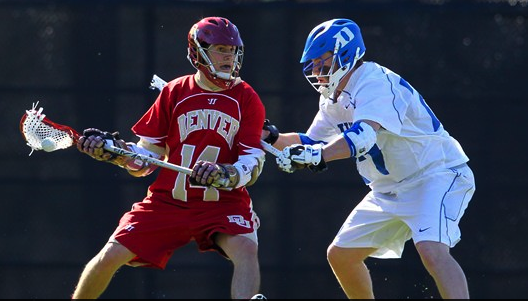 The Outlaws acquired soon-to-be Denver Pioneers grad Erik Adamson while the Bayhawks get Loyola Greyhound Nikko Pontrello. Adamson was the Bayhawks first draft pick this past January when they used the 14th overall pick to draft the Californian. Before his senior season, Adamson had 102 points on 76 goals and 26 assists during his three seasons with the Pioneers. The Outlaws roster has always been stacked with Pioneers so the move isn’t a surprise. Pontrello was the eighth overall pick out of Loyola. It was surprising when they passed over Adamson to start with, but now the Outlaws will get him and Wes Berg, another Pioneer. Pontrello makes sense for the Bayhawks being out of Baltimore. He has 155 points career with the Greyhounds. He will join an attack unit that includes Ben Rubeor, Matt Mackrides and Matt Danowski. The Bayhawks are 1-0 to start their season while the Outlaws are 1-1. Both teams won’t see their rookies from this trade for a bit, but long term this trade makes sense for both sides.